Colored circles - Activities that are displayed in the list below. Click on circles to zoom in or highlight Activities . 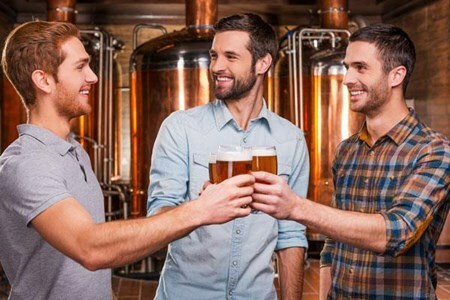 On your Brewery and City Tour of Toronto you will discover the architectural marvels that have made Toronto famous throughout the world like the CN Tower, Rogers Centre, ROM, AGO, ... moreToronto Entertainment District, Distillery Historic District, Yorkville, St. Lawrence Market, and the Harbour Front. 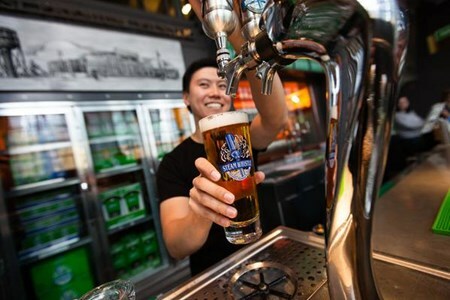 On this tour, you will also enjoy a local brewery tour of the Steam Whistle Brewery. The tour will begin with your guide picking you up at your downtown accommodation. Your guide will be transporting you in a fully insured rental car, with stops at Toronto's Entertainment district, Steam Whistle Brewery, St. Lawrence Market, and the Distillery District. Your guide will drive by many of Toronto's main highlights such as the CN Tower, Rogers Centre, Hockey Hall of Fame, and St. Lawrence Market. Don't forget to bring your camera! The tour will continue to the Distillery District, where you will stop and learn about the history of this unique heritage district - Canada's largest center for arts and culture. Next up will be a drive by the Eaton Centre, Old and New City Hall, AGO, China Town, Kensington Market, Ontario Parliament, ROM, and Yorkville with its high-end stores, boutiques, and restaurants. Your city tour will end at Steam Whistle Brewery to enjoy your brewery tour. 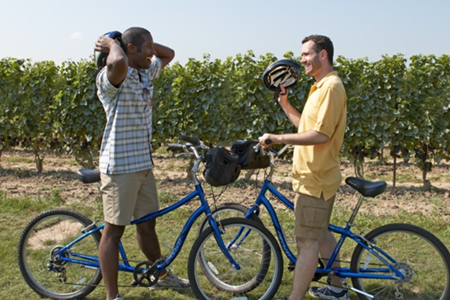 The Morning Glory Ride and Shine tour is a three-hour cycling tour to 3 award-winning Niagara-on-the-lakewineries. Our experienced guide will accompany throughout the tour which starts ... moreat 10 am to 1 pm. This cycling tour is available daily from April through October. If exploring all that Niagara has to offer, remember to visit the wine country. Whether you have booked a matinee or visiting the Niagara Falls one last time, start your morning with our cycle tour. You will have an opportunity to exercise as you sample some wine and view the spectacular sceneries of Niagara-on-the-lake. 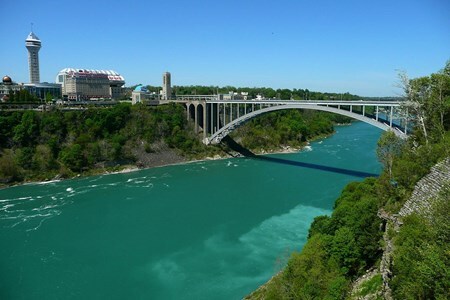 The tour commences with a bicycle ride along a route with beautiful sparkling scenes of the magnificent Niagara River. Our qualified tour guide will lead you through the famous Niagara-On-The-Lake, past riverside ports and bays. You will also view the celebrated Fort George alongside the Greater Niagara Circle Route. We will stop by a local fruit market on the Waterfront trail along the Niagara Parkway also known as the prettiest Sunday drives in the world. On this excursion, you will enjoy some unique wine tasting on three award-winning small cottages and get a chance to purchase excellent wine only found at these local wineries. This is a self-guided excursion that allows you to create your wine trail. Appreciate the breeze along the shoreline of Lake Ontario as you cycle from one wine estate to the other. ... moreCycle at your own pace as you view the beautiful sight of Toronto skyline. Take your time and relax on patios, take pictures or visit the local market and fruit stands. The Lakeshore Breeze is our most recent self-guided tour by bike. It is a comprehensive tour with optional stops planned with a concierge approach to wine country. It also allows the guests to sightsee the lakeshorevineyards by themselves and enjoy wine tasting at five pre-selected award-winning wineries. The wine tasting consists of 16 to 20 tasting samples including ice-wine. 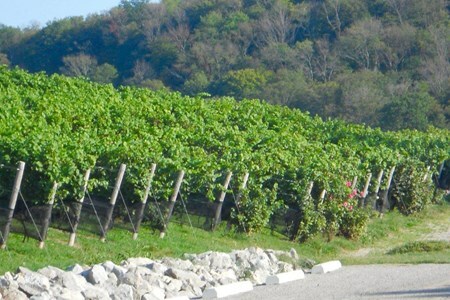 The Lakeshore Breeze tour also features an optional trip to any of the Niagara’s winery estates. 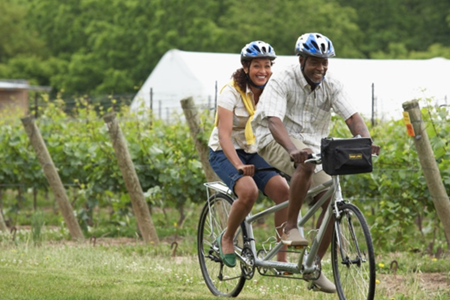 Build up an appetite with our unique Sip 'n' Cycle Bike Tour through Niagara Wine Country The stunning vineyards and placid lakes of Niagara Wine Country are breathtakingly beautiful, ... moreand there is no better way to see them than by bike. Work up an appetite and enjoy the view as we take you on a guided tour of some of the region's top vineyards. Sommeliers, wine growers, and wine makers will greet you at each location, welcoming you in to their exclusive wine estates and offering you award winning VQA wines for your delectation. These include ice wine and sparkling wine, as well as red, white, and rose wine. The whole experience is wonderfully educational and enjoyable too, and it is designed to be accessible to absolutely everyone - there is no need to have any prior wine tasting experience or expert knowledge of wine. Tours take place in small groups, so there is plenty of opportunity to ask questions. One of the highlights of the tour is a fantastic two course restaurant lunch at an exclusive location. If you prefer, though, you can also opt for a fulfilling picnic lunch out in the open air! Come and discover Hamilton’s thriving Craft and Cider. This tour enables you to explore hard cider and craft beer artisans of Hamilton and Dundas Ontario. Discover Hamilton Tour takes ... moreyou to 1 delightful cider house as well as 3 fantastic Craft Breweries. You’ll experience the affection and labor characterized by the cider and small-batch beer. You will be amazed by the craft beer in Hamilton. This is the ideal tour to explore the delights in Hamilton and Dundas. Come and discover 2 new Niagara wineries on this a half day tour where you enjoy food pairing and a seated tasting. You’ll experience a fun-filled morning when you visit the London ... moreBorn Wine Company as well as the Ridge Road Estate Winery. 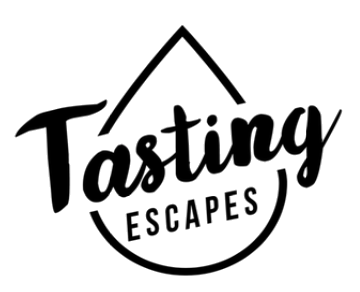 This Wine Tour enables you to visit 2 wineries in just 30 minutes on your way down the road from Hamilton as you enjoy brilliant tasting experiences at each. This destination has well-secluded wineries so close to town! Ridge Road Estate Winery is a beautiful private location nestled along the top on the Niagara escarpment on the Vinemount Ridge. The modern rustic-refined tasting room offers a seated pairing guided by Ridge Road’s wonderful staff. While at London Born Wine Company you will enjoy a bold and energetic twist on wine tasting. The blind tasting experience combines artisan cheeses and flavoured dark chocolates. The black wine glass blind tasting is presented seated in the wineries barrel cellar. 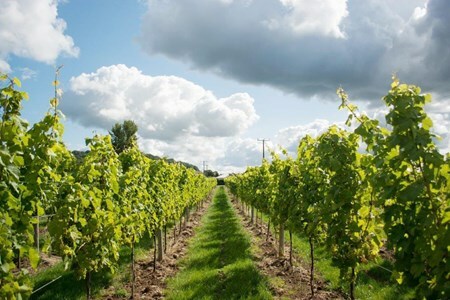 This British themed, family run, winery is a fantastic experience with is sure to please. Our winery partners provides an informative tasting experience as you taste their lovely red and white wines paired. We'll take you to the most fascinating locations of the city, from the scenic views at the Queen Elizabeth Park to Totems of Stanley Park. 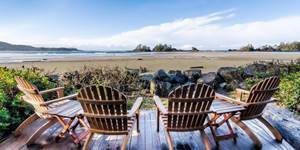 We'll also take you to the exotic Chinatown, and also tour the crafty Granville Island, this package has something for everyone. You'll get a chance to taste the latest spirits while the distillers explain to you all about the distillation process. This experience will definitely change your knowledge of cocktails. Our experienced local guides will take you around the town in style. You'll leave the bus crowd behind to experience a personalized guide and get to travel at your own pace. We'll take you to the lush agricultural land just outside Vancouver, where you'll understand why British Columbia has a reputation as the fastest growing wine region. Here you'll discover some excellent, small batch wineries. We'll take you on a grand circle around town, and cover the most enchanting locations of the city. From the exotic Chinatown to the Totems of Stanley Park. You'll admire the picturesque views at the Queen Elizabeth Park as well as the tricky Granville Island, this trip is tailored to offer something for everyone. You'll spend the afternoon amidst the vineyards and get a chance to taste grape and fruit wines of a wide variety, at each location. Our professional local guides will take you around the town in style. You'll leave the bus crowd behind to experience a personalized narration as you enjoy the trip at your own pace. 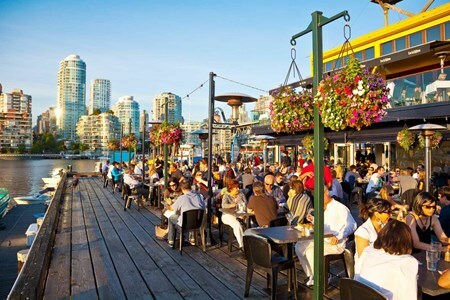 We invite you to join us in our Best of Vancouver City tour in the morning and later on enjoy an afternoon of beer and fun. Come and discover British Columbia's renaissance in Craft ... moreBeer production. New micro-Breweries are coming up all over in this region especially in Vancouver. This tour is perfect for those who enjoy beer, as well as for those who perhaps have not experienced tasting an array of diverse alternatives. This experience is designed to help you find your ideal beer. We'll take you on a grand circle around the city and cover the most delightful destinations of the city. From the panoramic views at the Queen Elizabeth Park to the Totems of Stanley Park. We'll also take you to the unique Chinatown as well as the crafty Granville Island. This package is tailored to offer something for everyone. You'll spend the afternoon touring some of the numerous fine small-batch brewers within the town, with tasting at each location. 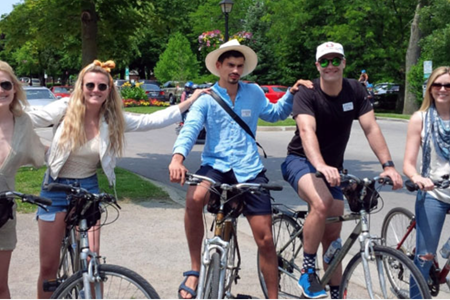 Our talented local guides will take you around the town in style. You'll leave the bus crowd behind to enjoy a personalized description as you tour the town at your own pace. Come and join us on our Old Toronto Beer Tour, and experience an authentic all-day city beer tour. This tour was first experienced in 1998 and is tailored to give you a brilliant full-day ... moreSaturday experience. You’ll explore the history and culture of Toronto against the backdrop of our diverse brewing heritage, that fuse the past with the present. This tour offers you an all-inclusive travel experience, where you visit the Distillery District. You’ll enjoy a fully guided tour to 4 breweries with tutored tastings, charcuterie-style lunch, transportation, and sightseeing at Fort York and Corktown, as you chat with the knowledgeable hosts. We begin our Old Toronto Beer Tour at 11:00 a.m. on Saturdays at Steam Whistle Brewery located just south of the SkyDome in Toronto's historic railway 'Roundhouse'. (Take the Queen's Quay streetcar from Union Station to York Street and walk a short block north). We will be greeted by our professional beer tour guide and the friendly folks at Steam Whistle. Following a brief introduction and a taste of Steam Whistle's popular European-style Pilsner, we will commence with our special VIP tour and interpretation which will include the Steam Whistle story, the brewing process and the Pilsner style, as well as the home of Steam Whistle, the historic Roundhouse. Following our VIP tour, we'll sit down to enjoy a 'charcuterie-style' lunch accompanied, of course, by a refreshing "unfiltered" Steam Whistle Pilsner and the great company of new friends found. Our 2nd stop will be at Fort York: the birthplace of Toronto and home to the oldest buildings in the city. Ours is the only Toronto city tour to feature Fort York as a stop! A national heritage site, Fort York was built in 1793 and is a fascinating step back in time, right in the centre of our city! Since Soldiers in the British Army were alotted 'six pints a day' as part of their daily pay, this is where the history of beer in Toronto truly begins. Boasting the largest collection of original War of 1812 buildings, our Fort York stop will include visits to the Blockhouse Museum and the Officers' Barracks and Mess. On the way to our next brewery destination, you'll hear stories of Toronto's Brewing Heritage as we pass the Canada Malting Silos, recently designated a Toronto heritage building; Toronto's oldest tavern; the site of the original Toronto Molson "Fleet Street" Brewery as well as other points of historic and architectural interest. We will make a brief stop in historic Corktown, a largely Irish neighbourhood in the years following the Potato Famine and a brewing hub in pre-prohibition Toronto. Here, we'll re-discover some of Toronto's 'lost breweries' as well as interesting examples of the city's historic architecture. A brief tour of the neighbourhood will help us experience the ambiance of 19th century working-class Toronto. Formerly the Gooderham & Worts Distillery - the largest in the British Empire! - the Distillery District is a virtual city within a city and is regarded by many as the finest example of Victorian Industrial architecture in North America. Red cobblestoned streets and alleyways lead to interesting shops, galleries, restaurants and our two next stops - the Ontario Spring Water Sake Brewery and the Mill Street Brewery Beer Hall. 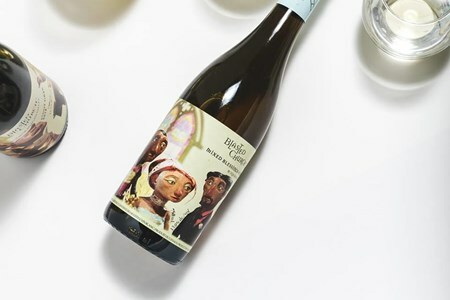 Technically a brewery, the Ontario Spring Water Sake Company is a unique addition to the artisan scene in Toronto and an exciting reflection of Toronto's multi-cultural vibe. The first sake brewery in eastern North America they use traditional Japanese methods and recipes combined with the highest quality rice and delicious Ontario spring water. Visitors can now enjoy fresh, unpasteurized, locally-brewed sake for the first time. This is a new stop on our tour and we find it fascinating to learn about this authentic Sake process and enjoy a tutored tasting of 3 different variations of this unique brew. After our experience of traditional Japanese sake, we'll then walk along over towards our next brewery stop, guided by our fun and knowledgeable beer and history expert. Passing by eclectic shops, street performances or newly-wed photo shoots, we are very soon at our next stop, the popular Mill Street Brewery Beer Hall. Housed in an old 'Tankhouse' within the 19th century Gooderham & Worts Distillery District it offers the ambiance of an up beat urban bar with that of a traditional German 'Bier Stube. Here we'll be sampling Mill Street's award-winning Lagers and Ales as well as an authentic 'Bier Schnapps' made in their gorgeous new copper nano distillery. Afterwards, you'll have some free time to hang out in the Beer Hall or to explore the "Distillery District" and visit wonderful shops like SOMA Chocolates, ARTA Gallery and Corktown Designs jewellery or possibly Balzacs where you can take a beer break and enjoy a superb cup of coffee. We board our bus for our last stop -- the new site of The Amsterdam Brewing Company. On the way we will drive by the site of the Toronto Brick Works and old Helliwell Brewery at the Todmorden Mills Heritage Museum & Arts Centre. Toronto’s oldest original micro-brewery, the Amsterdam is praised for their eclectic range of beers that include traditional lagers, dark ales,barrel-aged and fruit-infused beer. Hosted by your guide, you will partake in our final "tutored tasting" of a broad selection of available Amsterdam brews. There will just enough time to shop for your favourite beer or t-shirt and then we board our bus for the return trip to Union Station, and your safe transit home. Those joining us for dinner will remain on the bus for the short drive to our final destination, The Granite Brewery. We are greeted at the front doors by proprietor Ron Keefe. Well known to beer lovers far and wide, the Granite Brewery has made its mark since 1989, specializing in traditional top-fermented Ales, staunchly English in style. We'll have a chance to sample the unique qualities of these authentic Cask-Conditioned Ales in combination with a fabulous 4-course beer dinner. This Beer Lovers' Dinner is available for only $50 extra (plus HST), and includes all food, beer, taxes and gratuities. Please advise us in advance if you will be joining us for this added feature. Vegetarian options available on request. After dessert, a few last sips and some more great conversation, it will be a short walk to the Yonge subway line for your safe trip home. 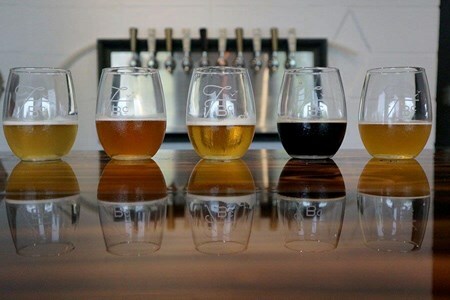 This half day tour enables you to experience tutored beer tastings at 3 distinctive stops, and also visit 2 breweries. You’ll enjoy an exclusive tour of the Toronto Railway Museum, ... morewhere you’ll ride on the new UP Express, followed by a beer and cheese tasting. 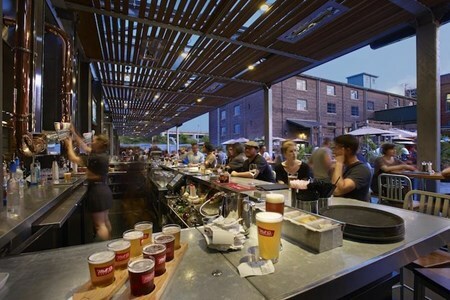 Later on, you’ll experience an "experiential beer tour" in Toronto's Junction "Beer District". Mill Street Lounge Union Station, Steam Whistle Brewery, and Henderson's Brewery. It also includes entrance to the train museum, return train fare to the new UP Express Bloor Station, plus pretzel and cheese tasting! Begin the tour with a fresh Pilsner & Pretzel in a 19th century Railway Roundhouse at Steam Whistle Brewery. A private guided tour of the historic trains next door at the Railway Roundhouse of the Toronto Railway Museum. Take in the scenic view on Toronto's SKYWALK to Union Station. Taste a special selection of beer at the CIBC UPSTAIRS Lounge featuring Mill Street Brewery in Union Station. Ride up one stop to Toronto's new Junction Beer District on the UP Express Train. 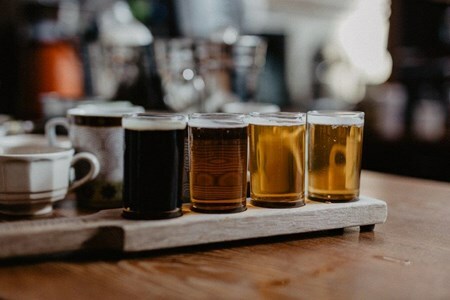 Learn about the art of brewing on the Experiential Brewery Tour, then enjoy a specially selected Beer & Cheese Tasting at the new Henderson's Brewery. Explore the diverse flavours of our favourite craft breweries in Toronto's Junction Beer District. Begin your day at Steam Whistle Brewery, housed in a vintage Steam engine Roundhouse, with a tasting of their fresh Pilsner, along with a baked soft pretzel. Following our Steam Whistle tasting, we will the grounds of the Toronto Railway Museum at the historic John St. Roundhouse. Here we'll explore the historic cabooses and engines from Toronto's early rail history with our guide. Our tour will continue on with a walk across the SKYWALK to the magnificently restored Union Station. After a brief story on the history of this site, we will relax in the CIBC UPSTAIRS Lounge featuring Mill Street Brewery and sample 4 of their Lagers & Ales. In keeping with our train theme, we will hop on board the UP Express for a train ride to their new Bloor Station in the heart of the Junction Beer District! We will disembark at the new Bloor St. Station in the heart of the Junction Beer District and stroll down the Art Walk to Henderson's Brewery, Toronto's latest addition to local craft beer. Here you'll enjoy a special "Experiential" brewery tour where we will sample at each stage of the brewery process. This will be followed by a beer and cheese tasting of Henderson's fine Ales as well as some award-winning beers of neighboring breweries from the Junction's burgeoning "Beer District", Rainhard Brewery & Junction Craft Brewery. Following our visit to Henderson's, you'll have the chance to "ride the rails" for your return trip on the UP Express to Union Station. (Return fare included in price). We welcome you to join us on our weekday walking tour, the Toronto Beer & Chocolate Tour. We are delighted to offer you a taste and enable you to experience the bittersweet love ... moreaffair associated with Beer and chocolate! This historic Distillery District offers an ideal setting for our exploration. It is home to two craft breweries and is renowned for SOMA chocolate maker. Join us in our pursuit to discover the jewels in the Toronto crown and understand why the city is such an adventurous destination! 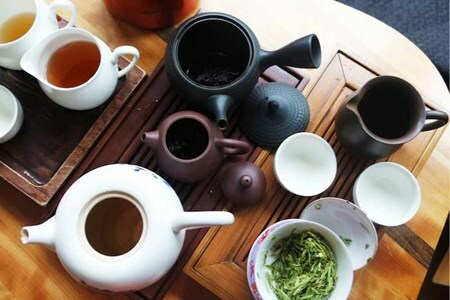 We invite you to Montreal, the renowned universe of tea, where you'll discover the history of tea up-to-date. You'll understand the current reality of tea in Montreal, and get to experience ... moretea from all angles while tasting as we proceed. Montreal boasts some of the most unique and infamous tea businesses that you can find anywhere in the world!! You'll meet a Montreal-based Chinese tea retailer and grower, whose family has specialized in Chinese traditional medicine for generations. This retailer has improved the family tradition with a fresh and modern branding strategy. You'll tour one of the top 5 tea importers worldwide as well as their tea sommelier school for some training on tea tasting. You'll also visit a Paris-based tea company that has been in operation for over 150 years! This company has a branch in Montreal and is popular for their perfuming styles. You'll then relax in a Victorian tea-based mixology bar with fancy bites and a cocktail. This experience concludes in a comfortable but chic tea room in the stylish Mile End where you can enjoy some desserts and tea. We are keen to open the world of tea to you, all you need to do is drop down via the rabbit hole! This guided experience is designed to enable you to explore all things tea! Are you thirsty for knowledge about all things chocolate, or eager to explore the subtleties of the finest cocoa? This guided tour on foot takes you to the Plateau and Mile, and the ... moreadjacent neighborhoods. You'll enjoy making, drinking, and preparing chocolate and its confection! You'll meet the most passionate people in the chocolate business in Montreal, including; - a teacher and retailer, a bean-to-bar chocolate maker, a confectioner or chocolatier, as well as a Mexican chef. 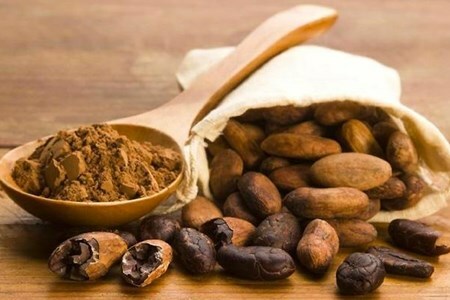 You'll learn more about the history of chocolate from Mesoamerican and precolonial history, colonial chocolate making, industrial production and finally the bean-to-bar movement. You'll get behind the scenes with chocolate experts and learn how they have made their dream a reality. 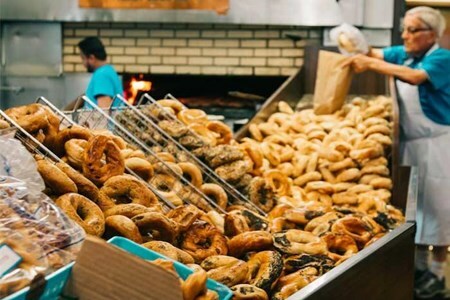 Join us on our guided Jewish Montreal walking tour and discover the community behind some of Montreal's most popular dishes. You'll learn about their rich heritage in Montreal's development ... moreand history. If you enjoy classic Jewish delights such as history buffs, then this tour is perfect for you! This guided walking tour covers 1.8 miles of fun and adventure! Come and explore the revival of Montreal's rich street food scene that highlights gourmet dishes prepared from scratch using fresh, local products. This experience is more than just ... morea hot dog cart trip! 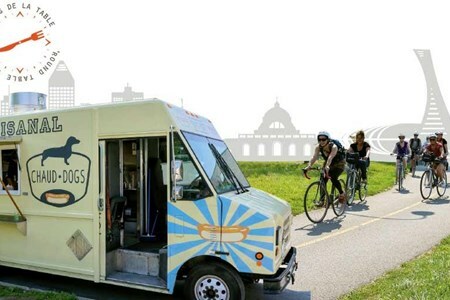 You'll enjoy the ultimate meals on wheels on this experience that comprise food trucks and bikes. This guided tour takes you through the bicycle paths along the Lachine Canal, in Medieval Montreal and downtown at a relaxed pace. This experience is perfect for people of all ages. 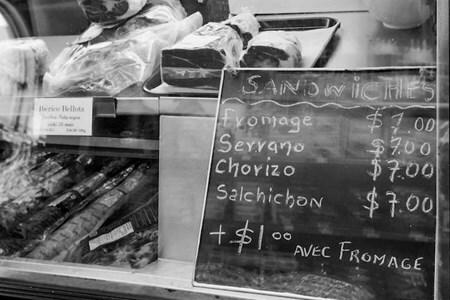 Join us on this guided walking tour and discover Montreal's Portuguese and Spanish community, food and the lovely atmosphere in the Plateau Mont-Royal neighborhood. You'll experience ... morea wine and tapas tasting with your friends or family in what we proudly call "tapear". Wine tasting, just like love, is packed with mystery and indefinable delights. For love to mature, it requires patience and understanding. You deserve a perfect and unique moment to sample diverse wines, to help you discover more about your new love. This tour is designed to enable you to unravel the five key steps in wine tasting. Your expert wine tour guide will tactfully narrate to you all about the five phases of winemaking during the trip. This tour will help you improve your confidence and conviction that this budding love for wine is genuine and an inspiring new dimension in your life. 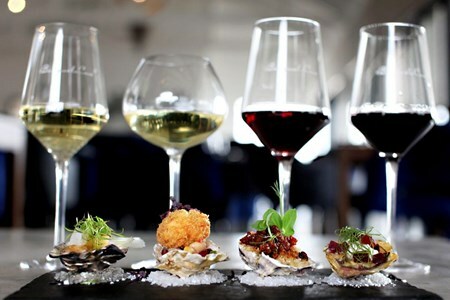 Your new-found romance will be heightened further when you match wine with food. You’ll take a trip from the sparkling wine cave to the vineyard, followed by the wine shop where you’ll experience the joys of food and wine pairing. Your romantic break includes a guided tasting session of six unique wines with selected food bites. Your new-found love divulges the history of the Okanagan’s premier estate winery and reveals the complexities of viticulture and viniculture. Join us on our Okanagan Wine with Spirit Tour and enjoy an experience packed with irreverent humor, barrels of good times and merriment. You’ll tour four of the Okanagan’s ... moremore notorious and playful wineries. The ambiance may be humorous but the winemaking is serious business. Each of the four wineries discloses a good story behind their unique names; - Monster Vineyards, Misconduct Wine Company, Blasted Church, and Dirty Laundry Vineyard. You’ll learn the secrets of each winery during the trip. Make no mistake the wine at each of the four wineries is sensational as some winemakers can attest. As terroir négociants boasting over 60 years of farming experience in the South Okanagan, we familiar with this terroir – the climate, site, and of a specific region – trumps all. Richard da Silva the owner-winemaker declares himself “a terroirist”. He believes the region is fundamentally significant to wine as some grape varieties flourish better here than in any other region. Richard da Silva says that he can travel anywhere in the Okanagan and Similkameen Valley in pursuit of the best fruit. Blasted Church Vineyards offer a heavenly wine experience. From the moment you leave the farm gate, you’ll discover that the vineyard is no place for traditional gravitas and wine stuffiness. This vineyard is Okanagan Valley’s most inspired, fun and creative destination for wine enthusiasts. Find local tasting tours & activities in Ontario, Canada. Sort by location, theme, tasting, activity, day, duration, price etc.